The early history of post-secondary education in B.C. This essay provides a brief overview of the development of higher education in British Columbia in the two decades period before the formal establishment of the University of British Columbia in 1915. It includes information about Vancouver College, the Royal Institution for the Advancement of Learning of British Columbia, and McGill University College of British Columbia. In 1894, an amendment to the Public School Act in British Columbia permitted McGill University to affiliate with any of the four existing high schools in B.C. This amendment resulted from negotiations between J.C. Shaw, Principal of Vancouver High School, H.M. Tory, a Professor of Mathematics at McGill University, and Dr. Alexander Robinson, Minister of Education for the Province of British Columbia. In 1899, part of Vancouver High School was renamed Vancouver College where, in September, classes were offered in the first year of Arts. McGill University controlled the curriculum, set and marked exams, and approved the hiring of instructors. Students were required to travel to McGill to complete their studies. During 1904/05, R. Lemuel Robertson, a graduate of McGill University teaching at Vancouver College received permission to improve and expand the University’s course offerings in British Columbia. Subsequently, two acts were passed in the B.C. Legislature: An Act Respecting McGill University (1906 Statutes of B.C., Chapter 28); and An Act to Incorporate the Royal Institution for the Advancement of Learning of British Columbia (1906 Statutes of B.C., Chapter 38). The first act permitted McGill University to establish, or cooperate in the establishment of, a University College in British Columbia for the higher education of men and women. The second act dealt with the establishment of the Royal Institution for the Advancement of Learning of British Columbia (hereafter cited as the Royal Institution) and outlined its legal authority, mandate and responsibilities. Under the Act, four persons were charged with the responsibility of incorporating the Royal Institution and were made permanent members of the Institution. These persons were William Peterson, President of McGill University; the Hon. Francis Carter-Cotton, of Vancouver; A.C. Flumerfelt, of Victoria; and J.W. Creighton, of New Westminster. Legally, the Royal Institution was granted the power to acquire by gift, purchase or otherwise, real and personal property, and to hold, grant lease, sell, or otherwise dispose of, real and personal property. Furthermore the Royal Institution had the right to establish, at any place in British Columbia, a college which was to be known as the McGill University College of British Columbia. The Royal Institution was to consist of not less than eight and not more than fifteen members, along with four ex-officio members: the Minister of Education; the Superintendent of Education; the Principal of McGill University; and the Principal of McGill University College of B.C. In 1906, the persons holding these positions were respectively, Alexander Robinson, Henry E. Young, William Peterson, and with the last position vacant. The Royal Institution was deemed to be Trustee of, and Board of Governors for, MUCBC. In these capacities, the Royal Institution was responsible for managing the financial and ordinary business of the College, including the appointment of auditors; the appointing a removing of the Principal, Registrar, Professors, Lectures and Instructors of the College; the levying of student fees; and the making of statutes and by-laws to regulate the affairs of the Royal Institution. In addition, the Royal Institution could make agreements with any Board of School Trustees, City Council, body or branch responsible for education for the purpose of expanding the advancement of higher education in B.C. Finally, the Act also stated that McGill University College of British Columbia was granted the right of autonomy over courses of study and examinations, was deemed to be a College of McGill University, and was permitted to offer courses of study accredited to degrees offered by McGill University. In accordance with the Act incorporating the Royal Institution, the members of the Royal Institution put forth statutes and by-laws in its publication The Statutes of the Royal Institution for the Advancement of Learning of British Columbia for the Government of the McGill University College of British Columbia. These Statutes, which will be referred to as the RI Statutes in order to differentiate them from the Statutes of the Legislature of British Columbia, set forth regulations for seven positions, or matters: i) the Governors; ii) the Senate; iii) the Principal; iv) the Faculties; v) the Registrar; vi) Matriculation and Course Study; and vii) Degree. The Board of Governors was the name given to the juridical body known as the Royal Institution. The members themselves, however, were known as Governors. As outlined under the Act establishing the Royal Institution, the number of Governors could not be less than eight nor more than fifteen, and furthermore, there were four ex-officio members. The RI Statutes stated that the positions of President, Secretary, and Treasurer would be filled by a Royal Institution member (a Governor) through an election process. Also, whoever was elected President of the Board of Governors would be appointed Chancellor of McGill University College of British Columbia. In 1906, the Hon. Francis Carter-Cotton was elected President of the Royal Institution, and therefore, Chancellor of the College. From 1906 to 1919, the Secretary of the Royal Institution was W.P. Argue; he was also Superintendent of Schools for Vancouver. As work increased, Lemuel Robertson was appointed Assistant Secretary. The Treasurer was Victoria financier, A.C. Flumerfelt. Under RI Statutes, the Principal, Vice-Principal, Registrar, and all members of the College were appointed by the Royal Institution. In 1906, George E. Robinson was appointed Acting Principal of McGill University College of B.C. and his duties included the superintendence of all affairs of the College pursuant to regulations enunciated by the Royal Institution; presiding, when present, at Faculty meetings; and teaching responsibilities as assigned by the Board of Governors. Lemuel Robertson was appointed Registrar of the College. He acted as Secretary of the Faculty, and of the Senate, and was responsible for reporting to the Senate all regulations passed by the Faculty for the Senate’s approval. Furthermore, he was to register students, to collect fees, and to give financial account to the Board of Governors. Finally, he was responsible for details of administration in connection with the work of the Faculty. McGill University College of British Columbia commenced operations in the fall of 1906, offering first and second years in Arts and Applied Sciences. In 1908, Victoria College was brought under the direction of the Royal Institution, and offered first and second year Arts. In the same year, McGill University College of British Columbia extended its program to include third year Arts. Initially, operating funds were provided by McGill University, but additional funding was solicited from the public both for operating costs and for a building fund. In 1908, the Legislative Assembly of British Columbia passed The University Act which established the University of British Columbia. Although the University was scheduled to open in 1913, it did not have sufficient funding to underwrite its development. McGill University College of B.C. was asked to continue operations and to offer classes until the end of the 1914/15 academic year. In 1913 and 1914, the Province of British Columbia contributed $5,000 annually to The College to help offset operating costs. In 1899, a portion of Vancouver High School had been renamed Vancouver College following an affiliation agreement between the High School and McGill University which allowed the College to offer first year Arts. When McGill University College of B.C. opened in 1906, classes were conducted at Vancouver College. In 1907, due to enlarged enrollment, the students and staff moved to a vacant building owned by the Vancouver City Hospital, which was located at the corner of Cambie and Pender streets, but the City Health Officer condemned the facility in January 1911. Shortly thereafter, the Province provided funds for the construction of two temporary structures on Vancouver General Hospital property (Fairview), at the corner of Laurel and 10th Avenue. Meanwhile, in 1910, the Province had granted to the Royal Institution a lease for land at Point Grey. The Royal Institution held a competition for the construction of a McGill University College at Point Grey, to which a number of architects submitted plans. In preparation for construction a contract for land clearing was issued and, by 1910, some clearing was done. While an endowment fund had been created, funds were not sufficient to commence construction at the new site. 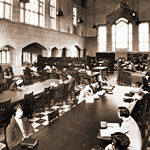 By 1913, recognizing that the new University would soon begin operations, the Royal Institution returned to donors, contributions that had been made to the building fund. Many donors, however, requested that their contributions be turned over to the University of British Columbia. The lease for the land at Point Grey was surrendered to the Chief Commissioner of Lands and Works for British Columbia on November 28, 1911. When plans for the development of a campus at Point Grey were shelved, space in the two temporary structures at Fairview was at a premium. Additional funding was provided by the Province for the erection of a permanent building, on the Vancouver General Hospital site, which was used by McGill University College of B,C., but which was to revert to the hospital when vacated. However, in 1915, it was the University of British Columbia that took over this facility, and it became the first Arts building. Faculty, staff, and students of The College merged with the new institution. Any operating funds that the Royal Institution had on hand in 1915, and any assets, such as the contents of the Library, were turned over to the University of British Columbia. The business of winding up the Royal Institution carried on until 1929, with a final meeting convened on April 13, 1928 (final disbursements took another year). At that meeting it was decided that a memorial to the late Chancellor, Francis Carter-Cotton, would be made from the remaining funds; that travelling expenses incurred by Board members in connection with the work of the Institution, would be paid; that an honorarium would be paid to W.P. Argue for his years of service to the Institution; and that the residue of the monies would be divided equally between the Vancouver and Victoria School Boards to provide prizes, to be known as the Royal Institution Prizes, for which high school students would compete.